This is my first time uploading to sew i knit but definitely not the last. Although I can't participate in the holiday party challenge due to Christmas Crafting, I figured I would show you what I HAVE been up too for the holidays. 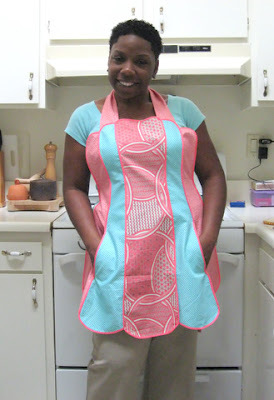 This was definitely my piece de resistance in apron making. 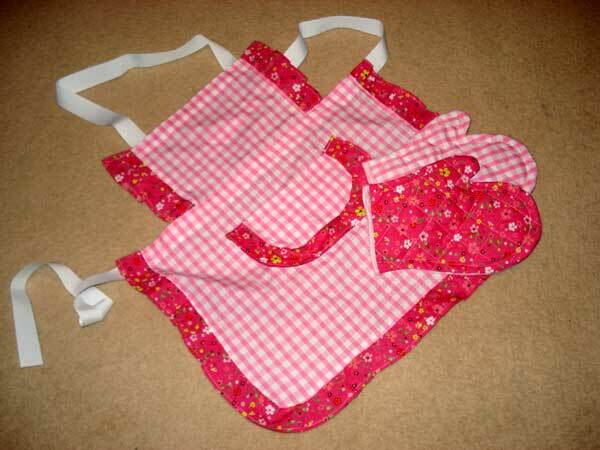 I have loved this pattern since I saw it made in black and white oil cloth material. I had yet to make it since, although I love aprons, I have very little use for them. So when my friend asked me for aprons I knew this one would be topping the list. You can check out my blog post for more pictures and details. Is this group on hiatus? defunct? Are the kind hostesses gone? I started with Sew? I Knit back when it was a bunch of knitters making a skirt. I hadn't sewn anything (apart from quilting) in a long time, and the support of my fellow adventuresome knitters helped me make a skirt, a handbag, a top... 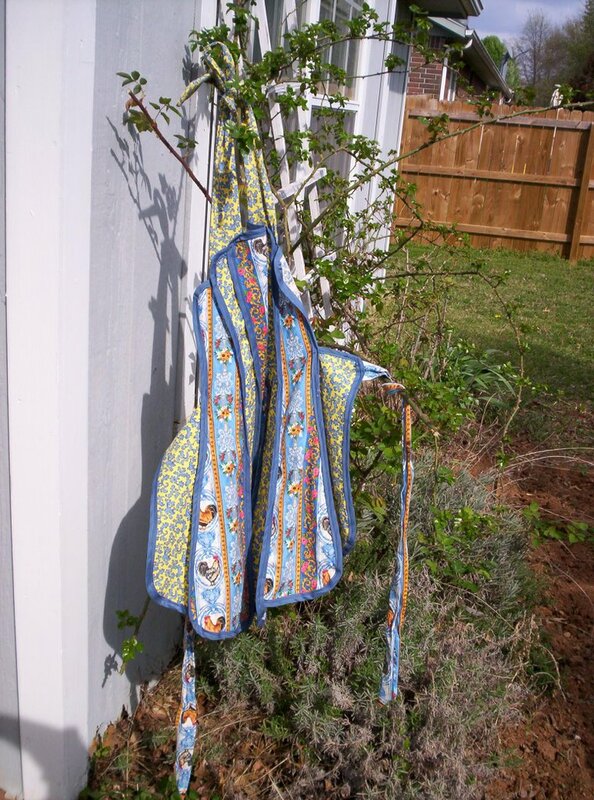 In fact, I realized that since I was sewing something every month I could sew a whole wardrobe, and I moved on from this to Sewing With a Plan. If you'd like to join the SWAPalong 2007, you can go here to do so. We haven't had a challenge here in a while, but I will always be grateful to the hostesses for getting me on the right track with my sewing. Thanks! 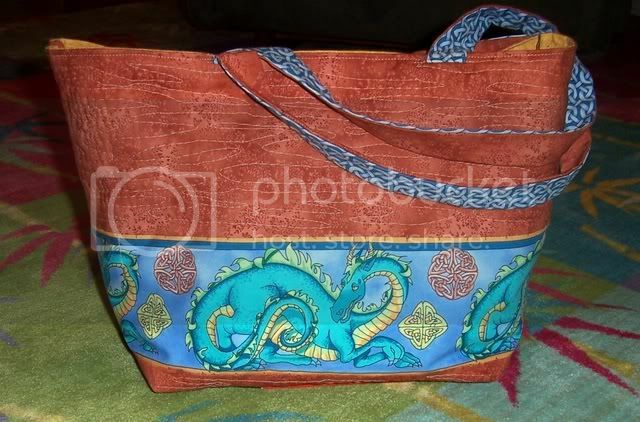 Alright, this was a bag I made a week ago as a surprise for a past swap. I know she's not on this list so I can share the bag pictures. It's been hard to not blog this bag, maybe this will bring relief esspecially since it won't be in the mail until tomorrow! 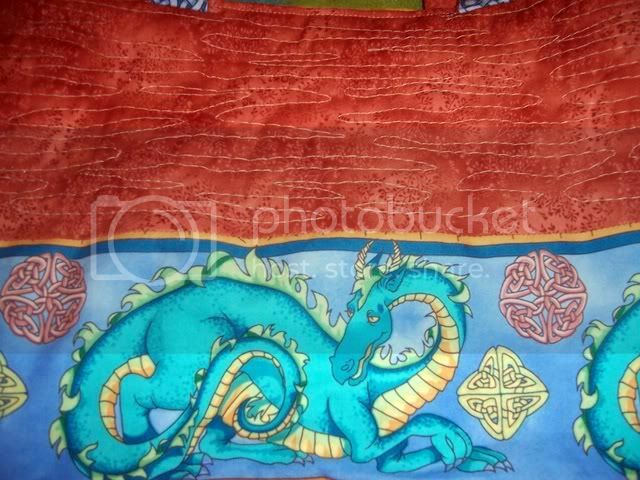 The dragon bag will be used to cart around small knitting projects like socks. For me a useful knitting bag should be big enough to carry a bottle of water, a knitting pattern, and notions. The bag handles are celtic knot strips which look remarkably like a cable pattern. Side pockets for cell phone and seperates. Here's a sock knitting bag I made for my pal in the Hogwarts Sock Swap. 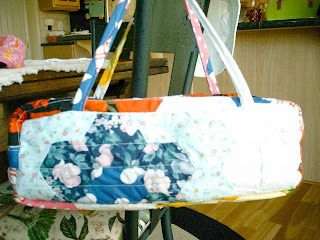 There's a wonderful online tutorial for this zippered bag. This was a very quick and easy sewed knitbag for small knits. Hi guys! I've been slack lately, but love seeing all your stuff. 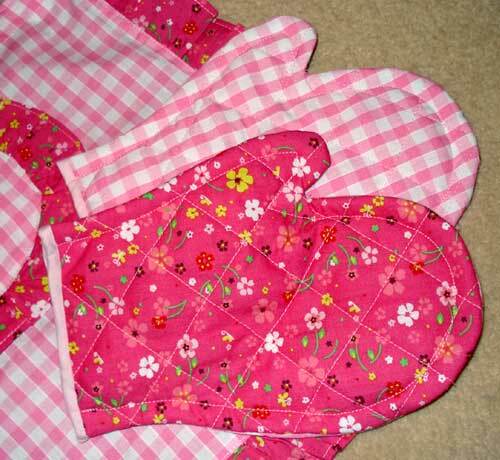 Summer is a BIG sewing time at my house and I am looking forward to getting back into the swing of things. 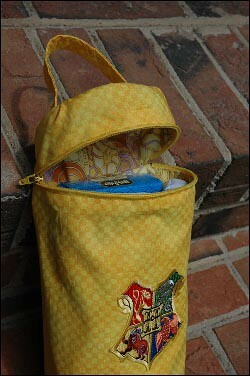 I'm having a contest over on my blog and he prize is a sewn sock knitting tote. Come check it out and enter to win! 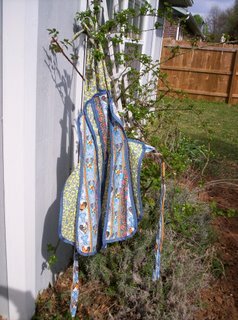 I just cooked up a bunch of totebags out of summery dishtowels and I put up a tutorial on my blog www.whatsthatgonnabe.blogspot.com. Get ready to carry that knitting to the beach in style! Have fun! 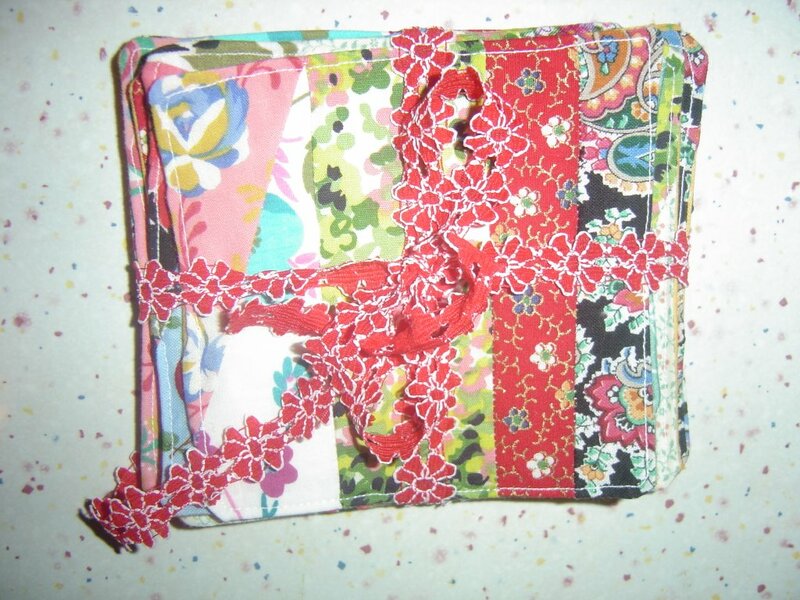 Here is a patchwork pincushion that fits perfect into my toolpurse in my knitbag. I found the pattern in a danish patchworkbook which i don't remember the name of anymore..
Hi all, I rarely post because it takes me so long to get anything done that I usually don't make the deadlines. But here I am ahead, because I just finished this bag. Its from Amy Butler's new sewing book. The pattern was challenging, but easy to follow with lots of directions. 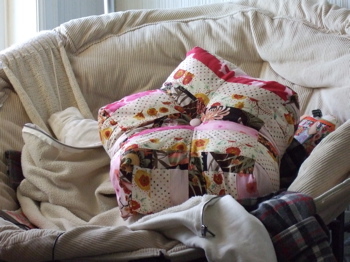 I actually used a quilt top that I bought at a flea market. I love the rectangular shape and it holds knitting projects easily. Its lined, but I won't show a picture of that part - its not great (but it works). 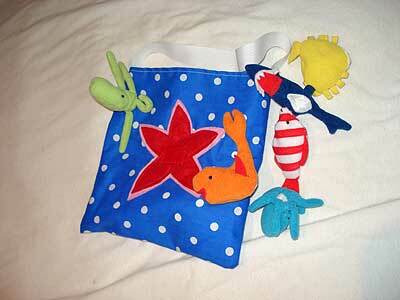 Here's my new knitting bag -- you can never have too many knitting bags, can you? 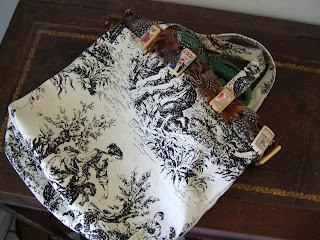 It is an ordinary toile-print canvas tote made un-ordinary with feather trim and blank wooden tiles decoupaged with images from vintage sheet music. 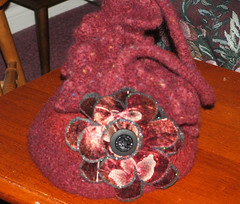 The idea was based on a bag in The Impatient Beader Gets Inspired. This project will last from April 1 to May 31. If anyone finds any good tutorials or ideas, please post them! If you would like to join in, send in an email by April 8. Since there has not been a new assignment posted, I am sneaking this kitchen item in. This apron is intended to add to the French air of my kitchen, begun with the hot mitt below. 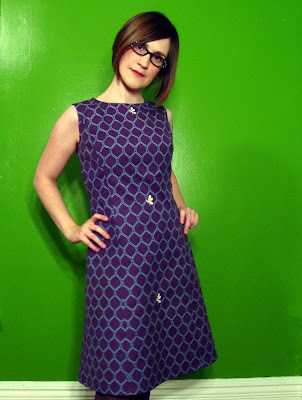 McCall's 3979 is the pattern. 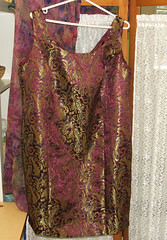 This apron is constructed oddly -- you sew the pieces wrong sides together and then encase them with bias tape. 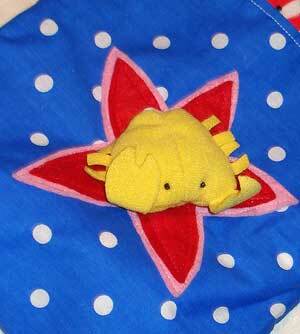 It makes for fiddly construction, but when you're through at the sewing machine, you're finished -- no hems. 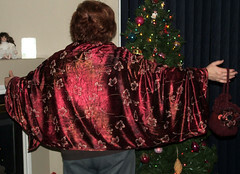 This pattern gave me an opportunity to practice princess seams and topstitching in a relatively nonthreatening context. I mean, I'm going to cook in this, wipe my hands on it, lean against counters covered with cleaning supplies... how bad can I feel about poor-quality topstiching? Next time, I'll do better. I have put it out in the garden to add to the insouciant charm of the whole thing. I also intend to make a quilted table runner using these Provencal fabrics, but there is no way I will finish it in time to sneak it in to this month's Sew? I Knit! 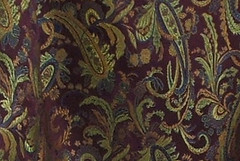 I am therefore just offering you a photo of the fabrics. 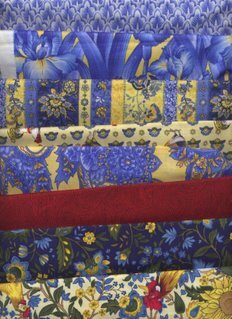 These are from Keepsake Quilting -- the French Garden medley and the Country Hen medley. My plan is to make a patchwork runner (I realize that this is not very French, but I understand that American-style patchwork has become popular in France lately) and then applique it with flowers. Further insouciance there. With sufficient wine and garlic, this should transform my kitchen into a South-of-France haven of joie-de-vivre. And, yes, insouciance. 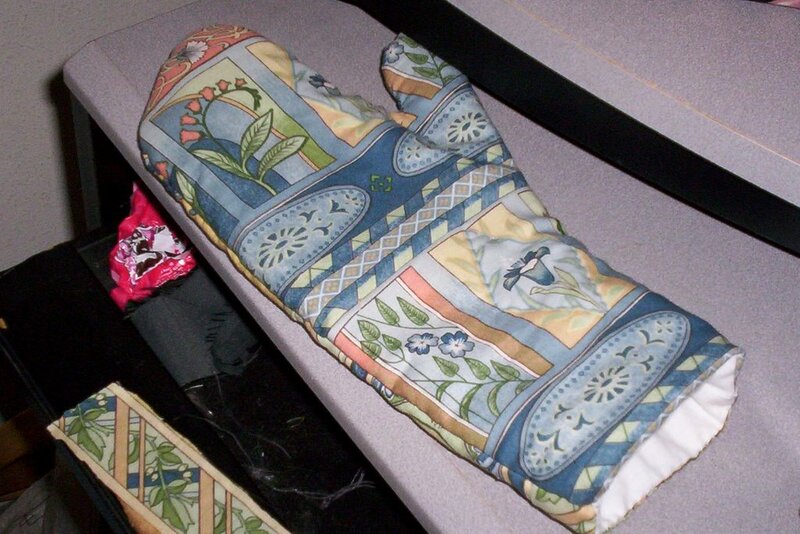 I have a successful oven mitt. This is from an out of print Ondori book. You can read details at my blog here. I hope to make more kitchen items, as my kitchen is in need of an update, but this is a good start.